Please note the different Production Methods below and visit the DESCRIPTION tab at the bottom of the page for INSTRUCTIONS on how to provide measurements. Contact us in case of any questions. Agreement for customisation: Required I confirm that I have provided accurate measurements (as described under the instructions section) and that I fully understand that this customised product, made according to the specifications and measurements I have given, cannot / will not be exchanged and/or refunded, in case the information provided by me happens to be incorrect. Wonderlands Custom Made is an exclusive product tailored to your style, fit, measurements and needs with 100% GUARANTEED SATISFACTION. We can customise your underwear, utilising two different processes: ACCORDING TO YOUR BODY MEASUREMENTS or REPLICATE FROM ANOTHER UNDERWEAR. Please make sure that you choose the Production Method option accordingly. In order for us to be able to make the perfect product for you, we kindly ask you to provide us with accurate measurements. We will use those measurements (WAIST, THIGH and HEIGHT as well as the other information provide (FIT & POUCH) to produce your underwear according to the specifications. Feel free to contact us in case of any questions. With a tape measure, go around your entire waist until you can form a full circle. 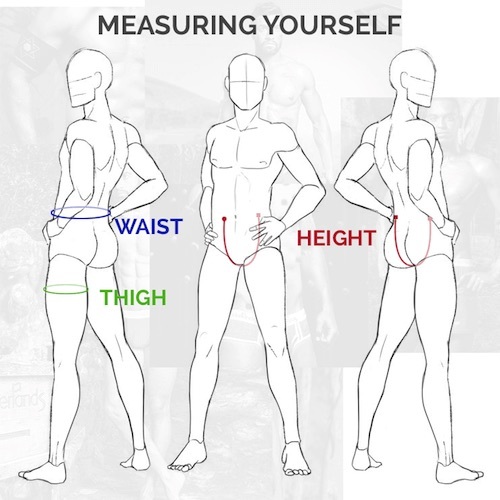 With a tape measure, go from your desired height (the point where you would like the underwear to start - somewhere around or below your belly button), passing the tape under your legs, until you can form a "U" Shape (the end of the height should reflect the same ideal height chosen by you initially on the front however, on the back side). With a tape measure, go around your entire thigh until you can form a full circle. Replicating from another underwear is also possible, if you already have a piece that you are 100% satisfied with (even from another brand). When taking measurements from another underwear, you should only provide measures from one side (instead of the entire circumference or going around). We will double the measurements in order to complete the final circumference. If you are in doubt that you have taken the measurements correctly, you can also attach pictures. Feel free to contact us in case of any questions. With a tape measure, take measurements of the straight line on the elastic band in the front only. With a tape measure, take measurements of the straight line of the height (including the elastic band). 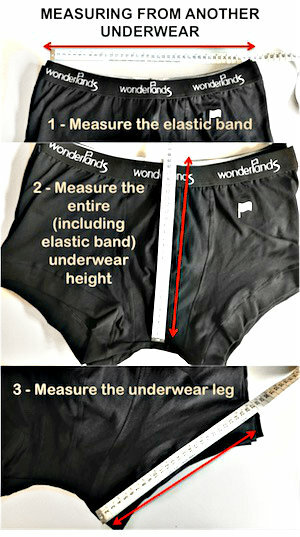 With a tape measure, take measurements of the straight line of the opening of the underwear legs. Up to 45 days from order to delivery (does not include any extra time at Custom clearance when shipped abroad). Up to 30 days from order to delivery (does not include any extra time at Custom clearance when shipped abroad). Note: Elastic bands should be smaller than your waist line in order to attach and hold the underwear to your body. Different types of elastic band offer different elasticity levels. The standard shrinking level shown above is a considerable comfortable level. We aim to produce each unit at the exact measurements provided by you. Nevertheless, small scale productions are conducted hand-made. Hand-made productions can present small variations on products, measures and features (even when produced at the same time). We guarantee a maximum variation of up to 5% on all measurements. The tolerable 5% variation, considering the elastic functions and properties on the materials we use for CUSTOM MADE products (4% elastane for the fabric & +25% on elastic bands), should have no (or very little) impact, while wearing or caring for the product. Therefore, products that present a variation within the tolerable level (up to 5% in any of the provided measurements) will be considered Acceptable Tolerance. If you receive a CUSTOM MADE product, presenting a variation above the 5% tolerable level, you will be entitled to request an exchange either by product correction or new production, for each product presented above the tolerable level. Those products should be shipped back to us for inspection and after product inspection, we will confirm back to you, whether such products fit the criteria for requesting either a correction or new production. In such cases, we recommend that you contact us before hand, providing us with all the necessary information and images, to facilitate and shorten the process, while avoiding unnecessary shipping costs. It is important in these cases, that such products, in addition to the above, also fit the criteria described on our Return Policy under EXCHANGES (in summary: in its original condition, not worn and/or not washed). CUSTOM MADE products cannot be refund. Your provided waist line measures 100 centimetres. Embroidered bands: Underwear will be delivered with an elastic band measuring 80cm. Printed (multi-colour) bands: Underwear will be delivered with an elastic band measuring 82cm. If your measurements were taken from another underwear, we will not apply any shrinking on the elastic band when producing your garment. In order to produce the perfect product for you, we need accurate measurements, as we will use those measurements (waist, thigh and underwear heigh as well as fit and pouch size) to produce your underwear according to those specifications. Please refer to the Description tab (on the left) for under the sections "INSTRUCTIONS FOR MEASURING YOURSELF" or "INSTRUCTIONS FOR REPLICATING FROM ANOTHER UNDERWEAR", depending on the Production Method chosen by you. In case of any questions feel free to contact us anytime. Custom made products cannot be exchanged or refund due to incorrect measurements provided by customers.